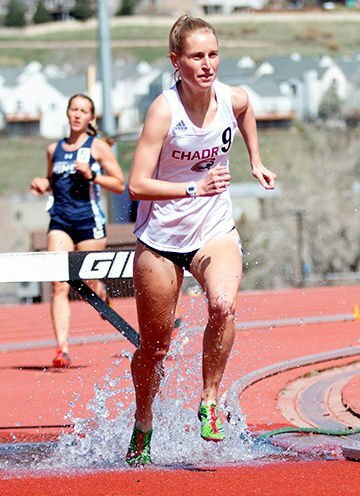 Chadron State senior Alyse Henry improved her time in the 3000-meter steeplechase by 10 seconds for the third consecutive meet during the Kit Mayer Invitational Meet at Colorado School of Mines on Saturday. She won the race in 11:39.15, her career-best except when she ran at sea level in California a year ago. Chadron State College athletes posted about dozen season bests at the Kit Mayer Track and Field Meet at Colorado School of Mines in Golden over the weekend. The competition was stiff. Most of the Rocky Mountain Athletic Conference teams participated along with a several unattached contestants who have hopes of making the Olympic Trials a year from now. Among the leaders was senior Alyse Henry, who won the 3000 steeplechase and placed fifth in the 5000 meters. She won the steeplechase by 13 seconds and her time of 11 minutes, 29.85 seconds is her career-best except when she ran at sea level in California last year and set the Chadron State school record of 10:56.80. It was the third meet in a row that Henry has improved her time in the steeplechase by about 10 seconds. Henry’s mark in the 5000 of 18:37.23 is her career-best. CSC Coach Riley Northrup also was pleased that the women’s 4x400 relay team, which placed second, had its season-best time of 4:01.87 despite rather blustery winds. The team is comprised of Christina Frick, Chasidy Horton, Julianne Thomsen and Celeste Cardona. “They keep running a little better all the time,” Northrup noted. Horton had a career-best time of 25.42 in 200-meter dash and Cardona finished third in the 400-meter hurdles with a season-best of 1:05.07. Chadron State’s national indoor long jump champion and triple jump runner-up, Isaac Grimes, did not compete, but some of his male teammates performed well. Joss Linse was third and Brock Voth fourth in the triple jump with outdoor bests of 46-feet even and 45-1, respectively. Both are freshmen. Another freshman, sprinter Brodie Roden, had career-best times of 10.70 in the 100 meters and 21.90 in the 200. CSC junior Javan Lanier was less was just .02 of a second behind Roden in the 100 for his season-best mark. Three “professional” runners led the way in the sprints. The Eagles will wrap up the regular season schedule on Friday at a meet hosted by the University of Northern Colorado in Greeley. The RMAC Championships will be the following weekend at South Dakota Mines in Rapid City. 3000 steeplechase--1, Alyse Henry, 11:29.85; 6, Madi Watson, 12:37.89. 400 hurdles--3, Celeste Cardona, 1:05.07. 4x400 relay--2, Chadron State (Christina Frick, Chasidy Horton, Julianne Thomsen, Celeste Cardona), 4:01.87. 100--6, Brodie Roden, 10.70; 7, Javan Lanier, 10.72. Long jump--8, Joss Linse, 21-7 ½. Triple jump--3, Joss Linse, 46.0; 4, Brock Voth, 45-1.